A Christmas tree adorns the bow of the Rouse Simmons shipwreck in a 2014 photo. Local divers place evergreen trees on the ship every year to mark its sinking. Decorating Christmas trees often evokes sentimental memories of years gone by. The business behind this holiday custom has deep roots in Wisconsin’s history. 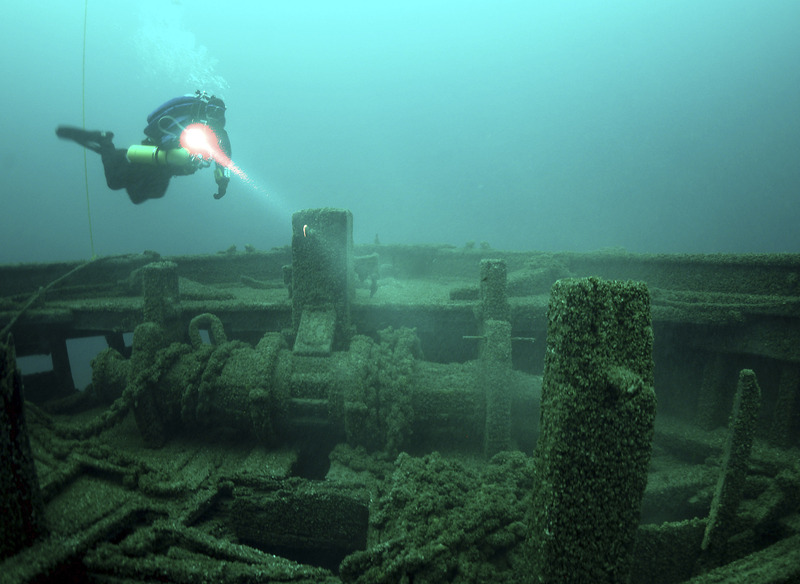 One story that stands out is an early 20th Century shipwreck that serves as a reminder of the often-dangerous conditions faced by those who have plied the Great Lakes' waters. Hoping to cash in on the seasonal tradition, Captain Herman Schuenemann purchased a 42-year-old lumber schooner named Rouse Simmons in 1910 to ship Christmas trees from Thompson, Michigan to Chicago. By this point in time, most of his competitors had discontinued the practice of sailing boats on Lake Michigan and were instead transporting trees to Chicago by train and selling them in the rail yards. But Schuemenann was banking on people purchasing a tree from the deck of the boat, which was decorated with lights and garlands and anchored in the Chicago River, as he had with other ships. By November 1912, the Rouse Simmons was in rough condition and no longer watertight, yet Schuenemann chose not to have the ship caulked before making the once-a-year voyage. On its way south after picking up trees in the Upper Peninsula, the vessel was spotted by the life-saving service at Kewaunee, flying an American flag upside down from its rigging as a sign of distress. The Kewaunee station was only equipped with a rowboat and couldn't catch up with the schooner in gale-force winds, so its staff phoned the life-saving service at Two Rivers. This station had a powered lifeboat, which headed out in search of the ship. But the rescuers were not able to find it. The Rouse Simmons, fully loaded with Christmas trees, sank on November 23, 1912, taking down sixteen men, including Schuenemann. An undated illustration depicts the Rouse Simmons near a shoreline. Tamera Thomsen, an archeologist with the Maritime Preservation Program at the Wisconsin Historical Society, shared the account of the shipwreck at a Jan. 19, 2016 presentation, recorded for Wisconsin Public Television's University Place. She also shared findings from efforts to document the condition of the Rouse Simmons and to determine the cause of its sinking. Thomsen theorized that the ship took on water, which ran forward to its bow. The Rouse Simmons then hit a wave with the bow low in the water, catapulting the rigging forward. The wreckage indicates that the crew deployed the anchor, possibly to stabilize the boat in the wind so they could launch lifeboats, but the anchor came loose and cracked off the bowsprit. A maritime archeologist diving at the Rouse Simmons shipwreck in 2005 shines a light at its windlass, a mechanism used to control the chains used with anchors. John Janzen, an underwater videographer and one of the many scuba divers who have explored the Rouse Simmons, continued the presentation with a discussion of the diving equipment he uses and the challenges he faced when exploring shipwrecks. Explaining that air bubbles interfere with recording of underwater footage, he uses a state of the art closed circuit rebreather which, unlike traditional gear, allows exhaled gases to be recycled back into use. Janzen shared footage of his 2015 dive through 165 feet of water into the wreck. He pointed out idiosyncrasies in how the anchor was deployed and other clues to what may have occurred onboard as the leaky boat sank. He also highlighted the remains of the Christmas trees still visible on the vessel. "It's a little bit hard to see the trees," Janzen said. "You just see them as little sticks. Just the trunks are remaining and a few of the branches." The Rouse Simmons was built in 1868 in Milwaukee at the Allan, McClelland and Company shipyards. The lumber schooner measured 124' long with a 23' beam, three masts, and two centerboard trunks. The ship was named for Rouse Simmons, brother of Zalmon Simmons, who was founder of Simmons mattress manufacturing company. Rouse was a grocer and secured a loan to pay for building the ship. Herman Schuenemann and his brother August went out each year on a Christmas tree voyage on Lake Michigan — the last run of the season. In November 1898, while Herman stayed home for the birth of his twin daughters, August set sail on the S. Thal, which broke up after a storm outside of Chicago. August went down with the ship. Water temperature is between 35- and 42-degrees Fahrenheit at the Rouse Simmons shipwreck. Quagga mussels, an invasive species in the Great Lakes, cover the remains of the Rouse Simmons. They're a little bit bigger and can go a little deeper in the water than the, related zebra mussel, another invasive also found in Lake Michigan. The story of the Christmas tree ship was also recounted in a University Place Presents discussion recorded on Dec. 14, 2011, with Thomsen and fellow maritime archaeologist Keith Meverden. 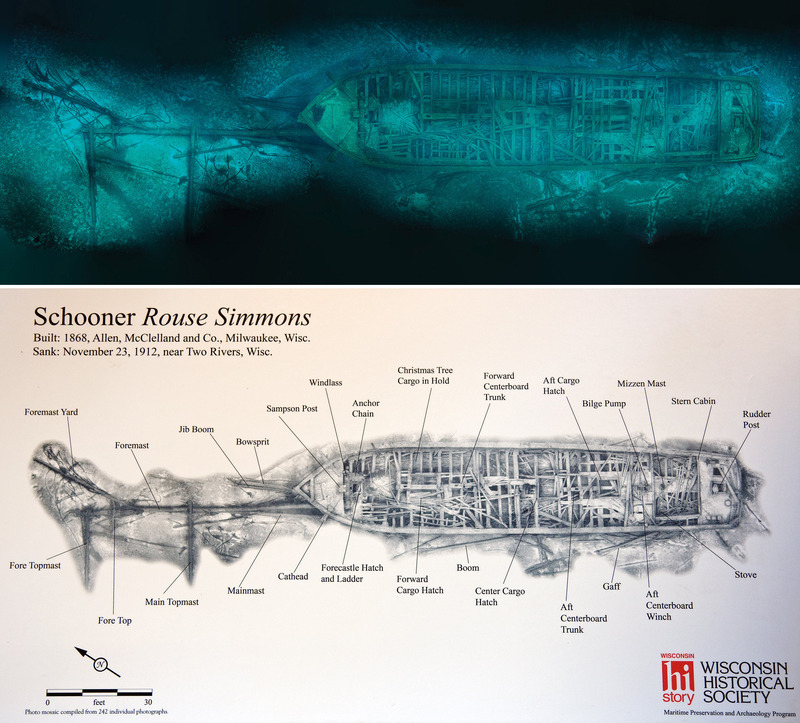 An photo mosaic provides an overhead underwater view of the Rouse Simmons shipwreck; the ship's structural elements and surrounding debris are labeled in an accompanying schematic. 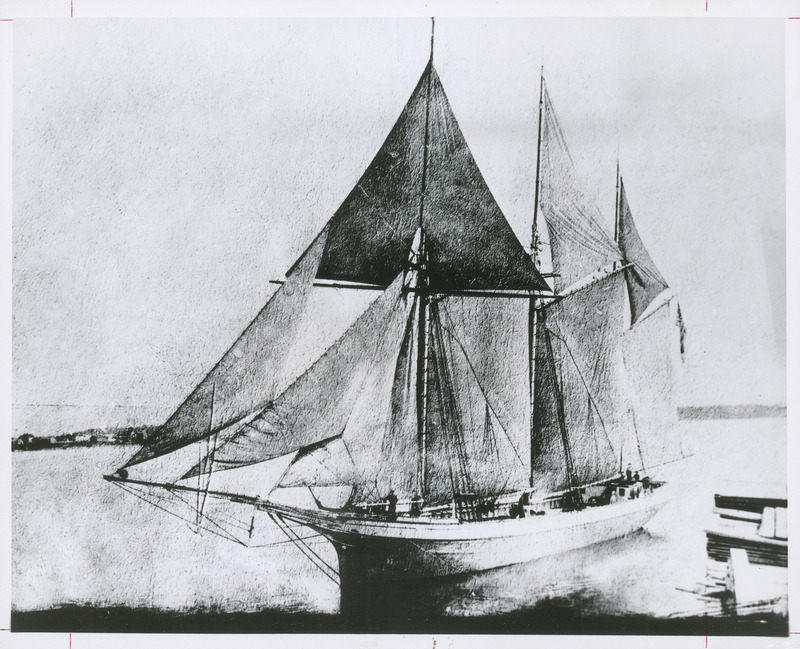 Thomsen on the Rouse Simmons' voyage from Thompson, Michigan: "They left under strong wind and in order to avoid some of the brunt of that wind, they sailed close to the shoreline. They tried to sail in the lee." Thomsen on the weather information from Two Rivers lifesaving station: "This is a paramilitary service, so they were required to fill out log books. They kept catalogs of the weather on the hour." Thomsen on the timing of the rescue attempt: "They launched the boat at 3:10 and they began their search. They made Rawley Point by 4:00 in the afternoon… We know that it had to have sunk sometime after 3:00 and before 4:00 when it came out of the range of what the Kewaunee life-saving station could see and before the life-savers from Two Rivers could get there." Janzen on the structure of the ship: "One of the unique aspects of the Rouse Simmons is that it had two centerboard trunks. Centerboard trunks on a sailing vessel were put down to stabilize the vessel from tipping and also prevented the vessel from being pushed sideway in the water. Most sailing ships had one." Thomsen on the current location of the undeployed starboard anchor: "That anchor was recovered by the discoverers of this particular ship and it's on display at the Milwaukee Yacht Club."